Is date night feeling a little stagnant? Have you run out of Netflix series to binge watch? (That’s a trick question. You can never run out of series to binge watch.) Are you an overachiever and are already considering where to take your sweetie for Valentine’s day? 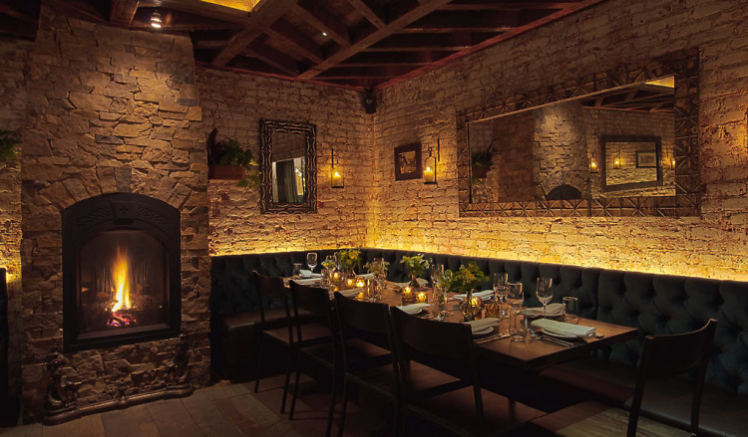 Well, instead of cozying up on the couch for another night of déjà vu, warm up with a hot toddy in front of these NYC fireplaces. It’s no real surprise that hotels have got a corner on cozy. Our first two options are places where you can also book a room. 1. The Marlton Hotel in Greenwich Village was once a haunt for hip flask swinging madman Jack Kerouac (presumably because it was full of steaming cafe flirts.) Have a drink in front of the lobby fire after a dinner at Margaux. 2. 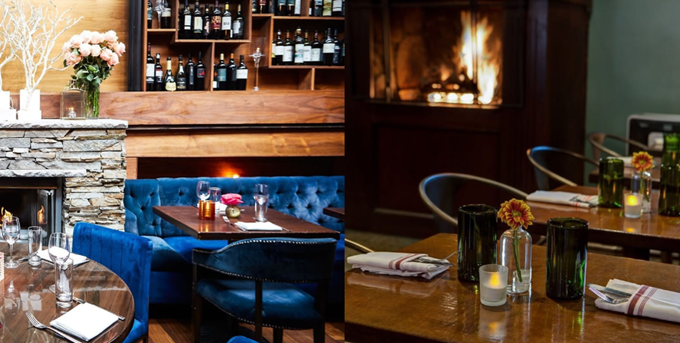 Society Cafe at the Walker Hotel delivers living-room style ambiance with cut logs and wine racks surrounding the massive dining room fireplace. These next two are both owned by hotel and restaurant owner (and andiron collector) Sean MacPherson, who takes his fireplaces seriously, using custom wrought iron and bronze fire screens for the cherry on top of the hotels’ focal points. 3. The Waverly Inn brings cozy to a whole new level, with ivy-covered brick, a glass-roofed garden room, and cast iron cats in the fireplace. Yes. Cats. 4. The Jane Hotel, on the other hand, greets fireside guests with owls. Dine before the disco lights start spinning and the red leather and velvet couches take on a whole new look. If it’s rustic you’re looking for, these two won’t disappoint with their log cabin and brick farmhouse feels. 5. Shelter in Williamsburg is a casual log-cabin venue with reasonable prices and an interesting specialty combination of pizza and empanadas. 6. Tiny’s and the Bar Upstairs is a three-story TriBeCa townhouse that dates back to 1810, and will charm the heck out of anybody–after they pass inside from the pink-painted exterior. 8. La Cigogne in Carroll Gardens is where you can get French and Alsatian comfort food in front of a roaring fire. Lastly, if retro’s your thing, we’ve got a couple of options. 9. The Lamb’s Club is actually full of fireplaces–but the massive 18th century limestone fireplace that is the club’s draw is located in the red-and-black main dining room. 10. The Standard High Line offers fantastic Manhattan views from its rooftop lounge, stretching from Meatpacking to the Empire State Building, along with some ’70s-style ambiance in the form of a spaceship-looking fireplace.